Choir loft, doorways, aisles: almost every bit of spare space in St Mel’s Church, Campsie, was filled on 9 August as the Catholic community celebrated 100 years since the founding of their parish and one-time convent school. St Mel’s principal Steve Borthwick and the parish’s Tonia Maresso welcomed all to the joyous event, including former parishioners and students at the school, some of whom were students there in the 1940s. Bishop Terry Brady was the principal celebrant at the Mass, joined by Frs Van Vuong Nguyen, Sebastian Savarimuthu and Heneli Lonai Mafi, with well-wishes from other priests, including Fr Thomas Carroll, who were unable to be there on the day (Deacon Louis Azzopardi exercised his ministry at the altar, too). Reflecting its present and historical make-up, prayers of the faithful were read by adult parishioners and students in English, Filipino, Lebanese, Hindi, Mandarin, Italian and Vietnamese. During his homily, Bishop Brady playfully objected to the omission of Gaelic, congratulating the parish, in all seriousness, on its “great richness”, past and present. He also lauded the contribution of the Sisters of the Good Samaritan, who established the school in 1895, and the Sisters of St Joseph, who served there from 1917–85. “It is right to give thanks for the past but we must thing about the future also, and that gives us a chance to go back to the basics,” Bishop Brady said. “We are a missionary church. Above everything else, we are missionary. “We’re not just a group of friends … We’ve got to be always reaching out, welcoming others into the community all the time; reaching and extending hands. In his message to the parish, published in a special commemorative booklet, Fr Nguyen said the parish must continue working together to bring the light of Christ to all. “Multiculturalism is one of the outstanding characteristics of St Mel’s right from the beginning,” Fr Nguyen said. “Refugees and migrants have been embraced like members of a family. No one ever felt like they did not belong. This can only be achieved by people of great faith. “In response to the generosity shown, both newcomers as well as established parishioners have worked together in building a better parish community. 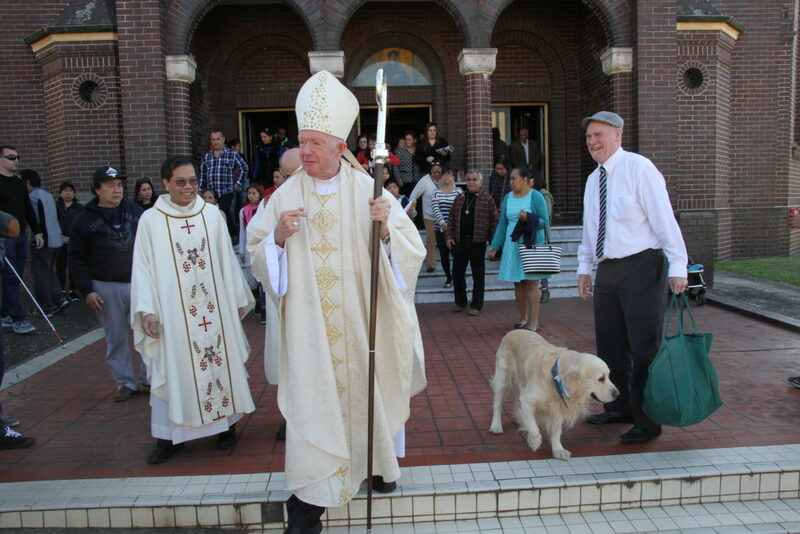 After Mass, Bishop Brady followed in the footsteps of Archbishop Michael Kelly, Archbishop of Sydney, who, 100 years earlier, had blessed the foundation stones of the presbytery and the convent (site of the present-day school).